Raj Chaudhuri is the Board of Director & Member of the Country Executive Team, American Express Malaysia. He leads a diverse set of processes for Customer Fulfillment Network line of business within the Global Servicing Network organisation. Raj is based out of Malaysia and leads a team of 300+ employees across Asia, servicing B2B and B2C customers for 8 markets. He moved to Malaysia in 2011 and has since made significant contributions to help develop Amex Malaysia as a Centre of Excellence in the network while maintaining a high focus on talent development. Raj joined American Express back in 1998 in India and has held several roles in different areas of the business. Prior to this role, he was the Service Delivery Leader for business planning based in India, and also held multiple roles within India’s domestic operations. 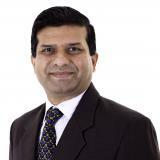 Raj has a vast, varied and multi country experience with a deep understanding of every market.